This simple utility, which operates as a System Preferences pane, displays a list of all applications as well as folders that you’ve created within Launchpad. 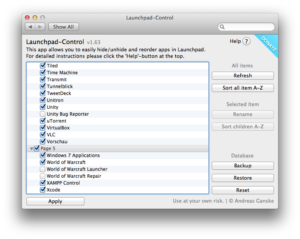 Next to each program or folder is a checkbox – if the box is checked, the application appears in Launchpad. Uncheck the boxes next to the programs you want to exclude from Launchpad, click Apply, and the Dock relaunches as your changes are applied. Please feel free to distribute and talk about this app on blogs, twitter or websites. I would really appreciate that. Work on Launchpad-Control was discontinued in 2013, as Apple started putting obstacles in my way by changing their database reindexing. This tool does and will not work for 10.8+. Launchpad-Control is Open Source and available on GitHub! Feel free to build upon my work. Thank you for considering to donate. Unfortunately, I stopped receiving donations as Launchpad-Control was discontinued several years ago. How can I hide an app/group? Just uncheck the box next to the app/group or click on it’s name. How can I move apps? To move apps just drag and drop them. To start dragging, you must click and hold down the left mouse while on the row of the item. Make sure that your mouse is not on the name or the checkbox because this will just toggle the visibility. You can move items onto different pages and in groups. Just drag and drop an app on to another app. You will then be asked to name the group. How can I sort the items? You can sort all your items alphabetically by clicking on the second button at the sidebar. It will then sort all the items (and the contents of groups) on all pages alphabetically. You can also sort the items on one page or in a group only by selecting the page/group and then click on “Sort children A-Z” (4th button in the sidebar and only available when page or group selected). When shall I hit “Apply”? Usually when your done hiding and moving the items. By clicking on “Apply” Launchpad will restart and show the changes you made. Some apps won’t show up in Launchpad again… What can I do? How can I uninstall Launchpad-Control? Go into system preferences. 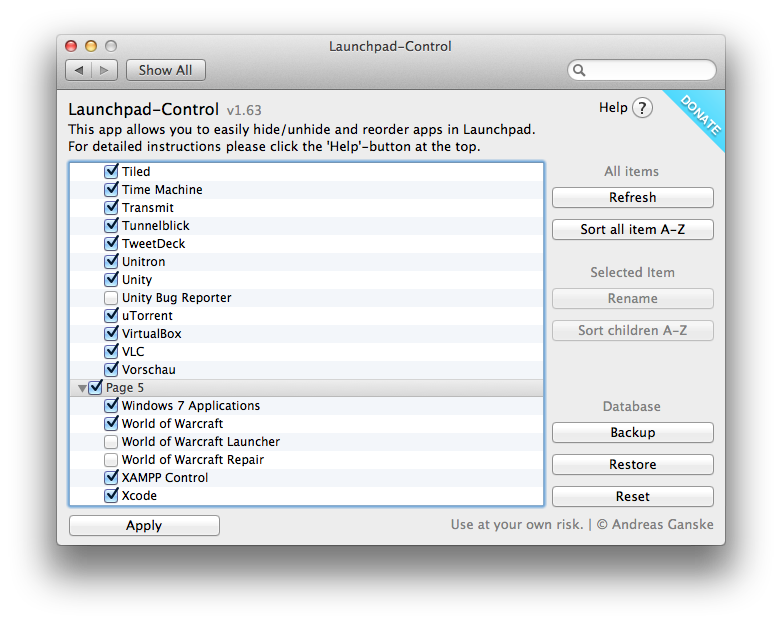 Right click on “Launchpad” and choose “Remove Launchpad from the system preferences”. That’s it!